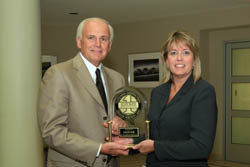 Gary Temple, executive vice president of Jaguar Land Rover operations, accepts the first place award for Jaguar in the 2007 JD Power and Associates Customer Service Index (CSI) study from Loretta Seymour of JD Power. Jaguar ranks number one in the 2007 J.D. Power and Associates Customer Service Index (CSI) study. Jaguar ranked first, with the highest ever score in the study, of 925 points on a 1,000-point scale—13 points above the top CSI performer in 2006. "This outstanding result in the JD Power and Associates CSI study reflects the tremendous progress that has been made at Jaguar these last few years. To rank number one in customer service, following our # 1 ranking in each of the last three years in the Sales Satisfaction Index (SSI) study is a tribute to the dedication and passion of all our Jaguar dealers in the United States" said Mike O'Driscoll, president, Jaguar Land Rover North America. The 2007 Study measures customer satisfaction with dealer service during the first three years of ownership. The level of satisfaction is measured in six key areas: service initiation, service advisor, in-dealership experience, service delivery, service quality and user-friendly service. From its beginning as a manufacturer of motorcycle sidecars in 1922, Jaguar Cars has grown to become one of the world’s premier manufacturers of luxury sedans and sports cars and with that, one of the most recognized commercial brands. The company's vision is simple: To produce beautiful fast cars that are desired the world over. The company operates two manufacturing plants in the United Kingdom and is fully engaged in environmental programs, community work and brand awareness exercises such as motor sport.